Eating disorder rules often have very little to do with food or weight. Turning my plate in a circle before I allowed myself to start eating didn’t do anything to affect how many calories I ingested or how quickly I dropped a dress size, but these obsessive rituals gave me the illusion of control, when in reality, I had none. Luckily, at this stage in my recovery, I am mostly free of ED rituals, however, they were tough to eliminate. In the depths of my eating disorder, I ran mostly on caffeine. I would stop by the grocery store on my way to work and pick up a couple of energy drinks—one to compliment the pot of coffee I’d consumed before leaving home, and one for lunch. I frequented coffee shops, often stopping at several during the day. By 5:00, I was an anxious, jittery mess. There are two differences in my relationship with coffee shops these days. One is that I don’t calculate the caffeine-to-calories ratio in everything I order; the other is simple: whipped cream. 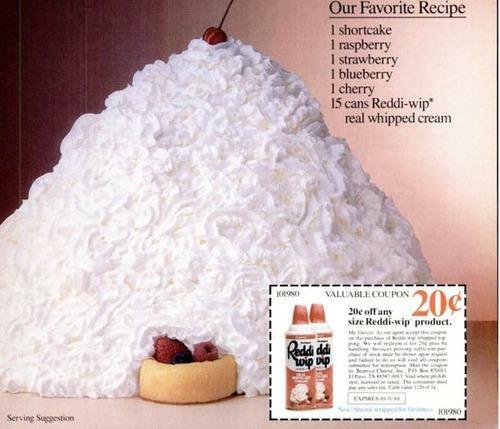 For years, I refused whipped cream on my drinks. It was silly, really. The few extra calories in a dollop of whipped cream were but a drop in the bucket of a Frappucino, but like most irrational ED rules, it didn’t matter. I was terrified of the texture, the color, the smell. As my eating disorder progressed, I stopped putting creamer in my coffee, then I stopped ordering anything creamy or milky. While my constant presence in Starbucks or its doppelgangers could have allowed me to be adventurous and try everything on the menu, I was limited to the low-calorie, highly caffeinated drinks anorexia permitted me to sip. Anorexia makes a lousy date, so I broke up with her. Now, I frequent coffee shops alone. My favorite one is a little orange store called Biggby Coffee where the baristas know me and my order: a large “Butterbear” with an extra shot, no whip. But just a few days ago, as Brianna the barista was making my drink, I said, “You know what? I’m going to be crazy today. Put some whipped cream on it.” Brianna grinned at me and topped my drink off with a lovely tower of whipped cream. As it happens, whipped cream is delicious. It’s fun to eat, fun to spray (especially into my dogs’ mouths), and keeps your latte from looking naked. I am proud to say that I am now a bona fide whipped cream-eater. Anorexia has no place in my coffee shops, at the dinner table, or in my life at all. So I’ll pass on the extra shot to make room for a little more whipped cream.